In this article, Hinge presents its newest study of how professional services firms go to market—and for accounting and financial services firms, there is good news…and some not-so-good news. Hinge just released the results of our newest study of how professional services firms go to market—and for accounting and financial services firms, there is good news…and some not-so-good news. 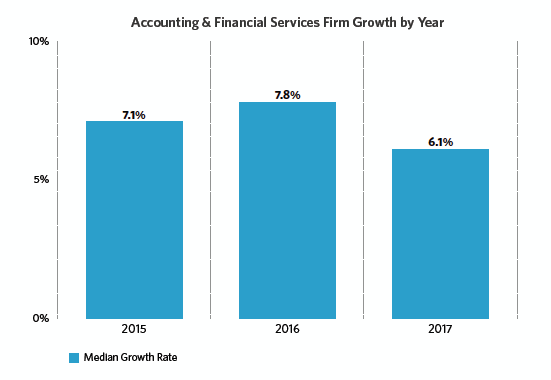 But before I get to that, let me give you a little background about our study, 2018 High Growth Study: Accounting and Financial Services Edition. Of the 1,000+ firms who took part in our survey, about one-quarter were in accounting and financial services—and of those, 150 provided the requisite financial information to be included in our growth analysis. Combined, these 150 “focus firms” earned more than $150 billion in combined revenue, with more than 645,000 employees. By studying how the fastest-growing firms approach and execute their marketing, your company can gain insight into how to best formulate you own marketing, sales, and revenue strategies. I will now share some of the high-level results of the survey—starting with the not-so-good news. 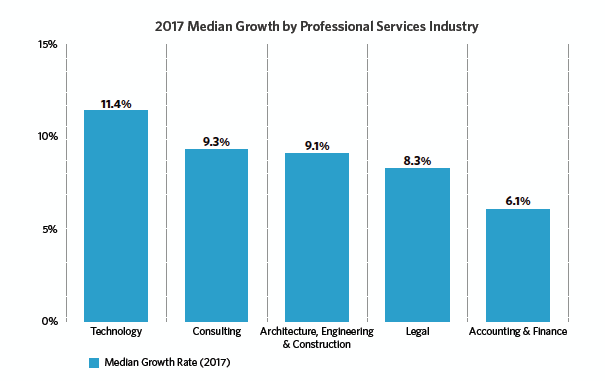 Overall, median growth for the industry lags all other areas of professional services, and is at its lowest in three years, as shown in Figures 1 and 2. Given the less-than-rosy statistics I shared above, the good news is that firms can improve their rate of growth. In our study, we looked closely at what we call High-Growth firms—those that not only grow, but do so at a significantly faster rate than their No-Growth peers. To be assessed in this elite category, firms had to have experienced a compound annual revenue growth of 20% or higher over a three-year period. I invite you to read an executive summary of the study for yourself (you can download a free copy here.) Meanwhile, here are three high-level recommendations for expediting growth, based on the practices identified by the High-Growth firms we surveyed. In our survey, we asked respondents to rate their ﬁrm’s level of specialization in ﬁve categories. 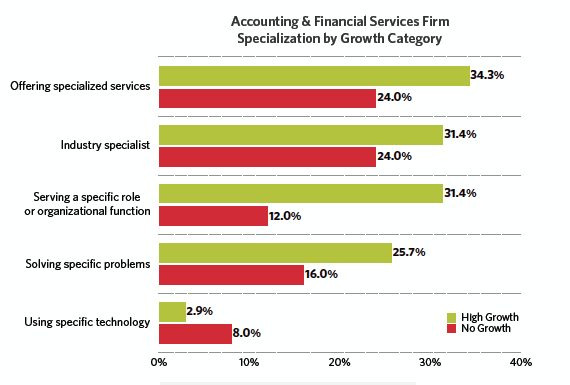 Figure 3 shows in which categories High-Growth and No-Growth ﬁrms assessed themselves as being most specialized. One clear message from the data is that High-Growth ﬁrms are much more likely than No-Growth ﬁrms to specialize in one way or another. But also notice how they specialize. High-Growth ﬁrms are much more likely to offer specialized services, solve defined problems, and serve clients in speciﬁc roles or industries. On the other hand, they are less likely to specialize in a particular technology. We also looked at how firms rated their SMEs in seven technical and business development skill areas. 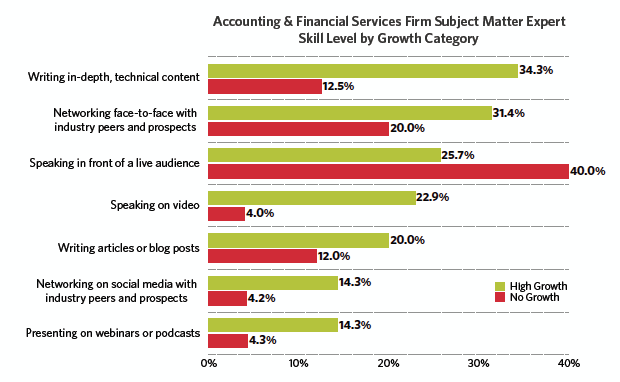 Practitioners in High-Growth firms tend to have greater skills in these marketing-related areas than their peers in No-Growth firms. One exception, as shown in Figure 4, was that of public speaking, where SMEs in No-Growth firms were ranked significantly higher. The quick takeaway is that when you are planning training for your SMEs, it pays to focus on technical and business development skills. High-Growth firms are also investing diﬀerently in marketing. This pattern is best seen in their greater adoption of digital techniques—and in the level of effort involved versus results. Of 10 digital marketing techniques, respondents who indicated using a particular technique were asked to rate the perceived level of eﬀort they invested on a scale of 0–10. In Figure 5, we compare the proportion of High- and No-Growth ﬁrms who gave various techniques a rating of 9 or 10. 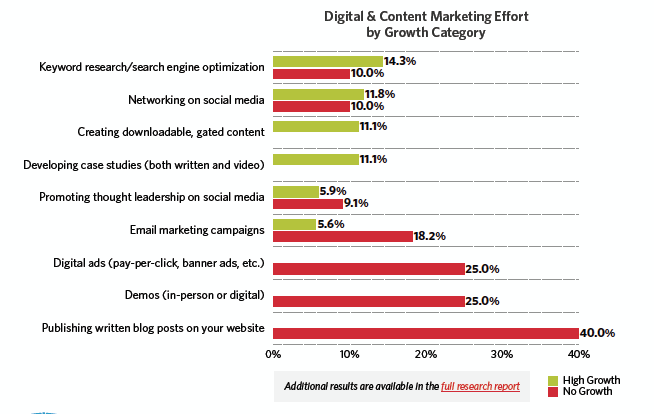 One of the key observations here is that although High-Growth firms use significantly more digital marketing techniques, they invest less effort in doing so. More than anything, the survey results show that despite a general slowdown in growth rate for the industry, there are certain firms whose growth rate consistently outperforms that of their peers. 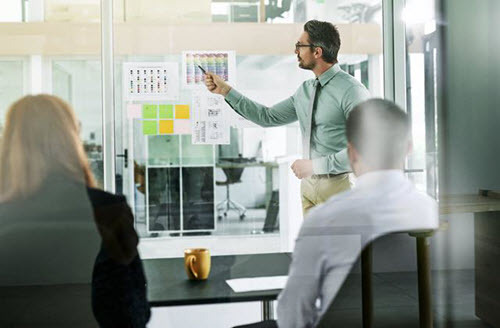 By understanding the way these firms approach and execute marketing differently, your firm can find insights into strategic changes that can help you increase your chances of speeding up growth—even in the face of strong headwinds. Lee W. Frederiksen, PhD, is Managing Partner at Hinge, the leading branding and marketing firm for the professional services. Hinge conducts groundbreaking research into high-growth firms and offers a complete suite of services for firms that want to become more visible and grow. Dr. Frederiksen can be contacted at (703) 391-8870 or by e-mail to LFrederiksen@hingemarketing.com.